How to create and save segments to display only flights based on the attribute criteria of your choosing. 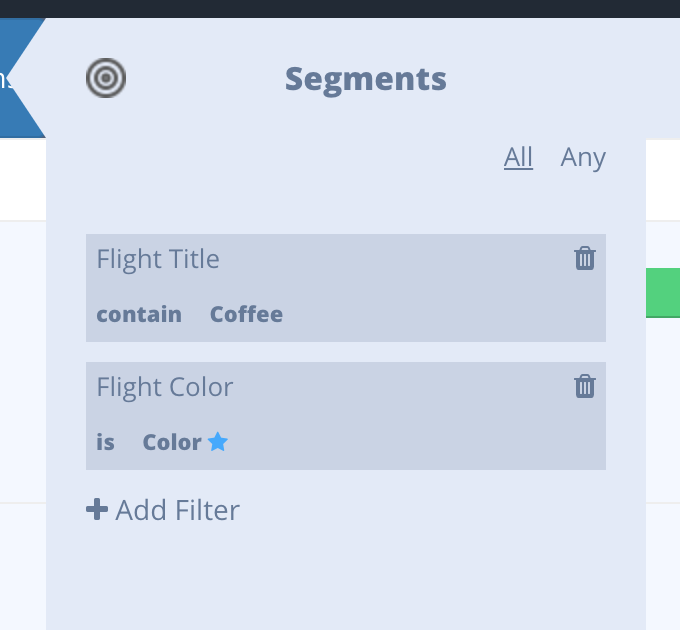 Segments allow you filter the data displayed in your canvas to only flights with attributes that match your input criteria. 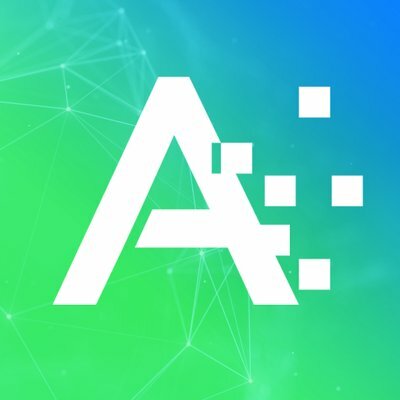 This can be used to filter to flights of a certain status, flights assigned to a specific person, or even to the Tags and Custom Field values that your team uses to organize information. 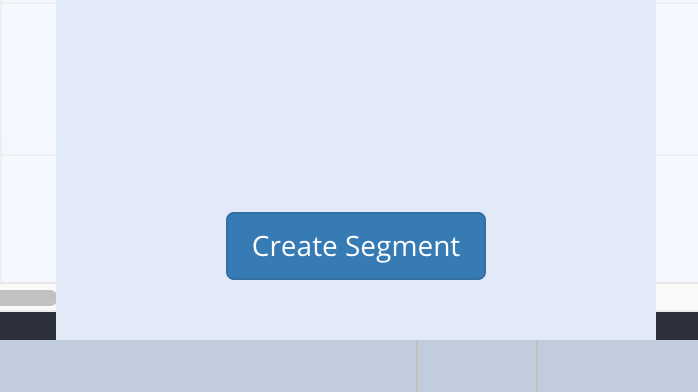 Here is a step-by-step example of how to create a Segment. Your canvas views can be filtered by flight attributes such as title, color or tags. 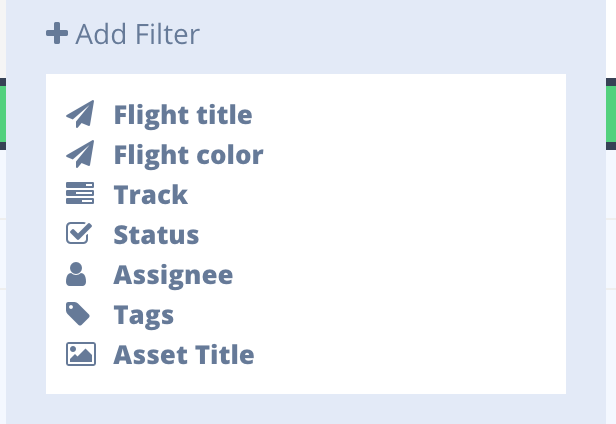 To create a segmented view of your flights, click the target icon on the upper right of your view to open up your flight attributes and create filters. Once the Segments panel is open, you can start to create filters. 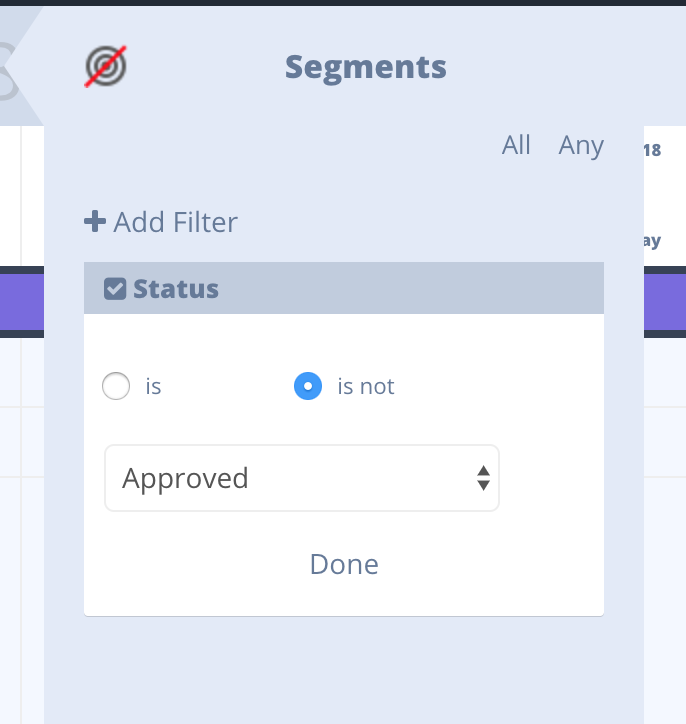 You can create a segment with multiple filters and decide whether single flights should match ALL the filters or ANY of them. You can think of this as using AND or OR across your filters. Any or All must always be chosen to apply across the filters created. For each filter you add, first choose the attribute, then the value, then click "Done"
You can add more filters from there. For example, in this segment, we want to see all flights that contain the word Coffee in the flight title AND that are blue. All is chosen, indicating that to meet the segment criteria, a single flight must be both blue and contain the word Coffee in the title. 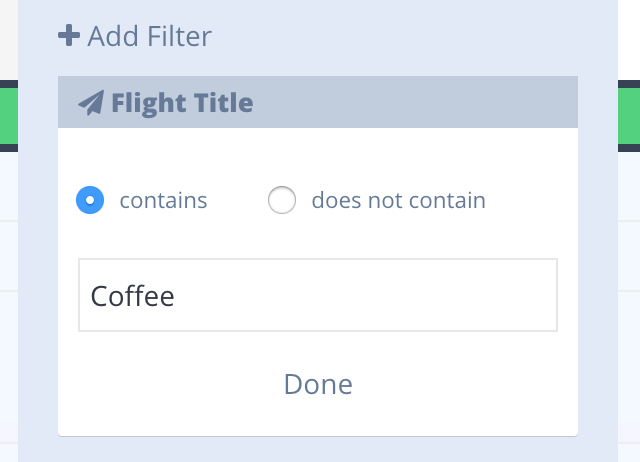 If we had chosen Any as the filter joining criteria, the canvas would show flights that contained Coffee OR are blue. This includes blue flights without coffee in the title. 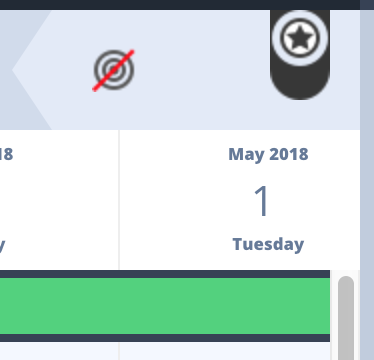 Once you have the filters you need, you can save the filter and it will appear above represented as a badge in the dark blue bar. Clicking the saved segment badge will immediately apply any segment criteria selected when the Segment was saved, regardless of the view or campaign you are in. Users can delete Saved Segments by clicking the Delete icon next to the Saved Segment's name in the menu.